Ambassador Mark Childress presented his credentials as United States Ambassador to Tanzania to President Jakaya Mrisho Kikwete on May 22, 2014. 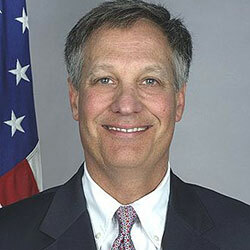 Childress has started his tour of duty from last month, taking over from previous US Ambassador to Tanzania, Alfonso Lenhardt who served the post since 2009. A graduate from Yale University in 1981 and from University of North California in 1986, Childress persuaded his post-graduation courses in Agricultural Law. He has served in various positions in the field of policy, legal and technical activities during his professional career, including serving two terms in the White House, as the Deputy Chief of Staff in the Obama White House and Senior Counsel to President Clinton. Apart from political and economic issues, Childress will also take charge of US support to Tanzania in areas like human rights, wildlife conservation and health. Government of Tanzania depends heavily on donor supports from US, Germany, Britain and Scandinavian states to aid its health projects. The US government also helps Tanzania in its wildlife conservation projects to save extinction of African elephants and other endangered species due to poaching. Fighting international terrorism and the piracy terror in Indian Ocean is another area of common interest. The tourism industry of Tanzania is also looking forward to the US partnership as Americans are considered as higher spending clients and responsible tourists in Tanzania.